What a difference a day made. Saratoga Racecourse went from being wall-to-wall with fans on Saturday to being a barren oasis on Sunday. The exodus has begun. Starting Monday you’ll be able to see the horse transport semis on the backstretch. By Friday - the start of the Final Stretch weekend, it’ll seem like fall and you’ll wonder where the time went. Social Media Day, a trumped up promotion that was geared toward helping the New York Racing Association gain followers for its Web sites, took a back seat to Travers reminiscence. 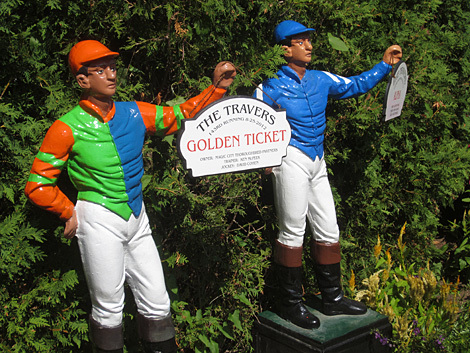 Two cast iron jockeys in the walking ring were painted in the silks of the Travers winners and were quickly identified as photo subjects. Jockeys in paddock painted with wining colors of dual Travers winners. 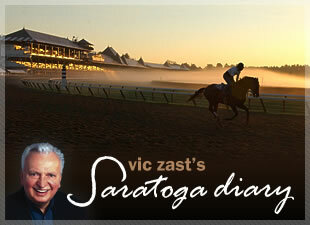 Siro’s, not Saratoga, is the true social network, said one fan. About a dozen people with smart phones sat around in a roped-off circle of picnic tables near Big Red Spring while some guy encouraged them to wait for a jockey to arrive. Yet, 1000 people walked home with a FREE tee-shirt for simply signing up to “like” NYRA’s Internet sites. That’s if there were 1000 people who ambled by the area. 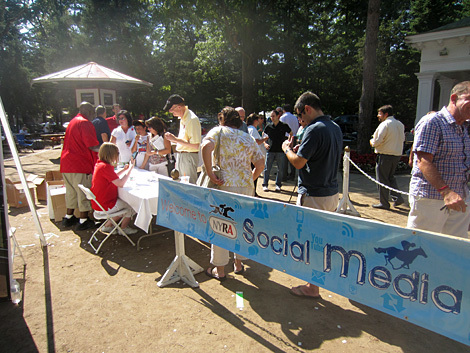 Social Media Day participants line up to "like" NYRA Web sites. Speaking of ambling, several races were held in which horses ambled. Speedy’s Gal in the first, Mr. Cowboy in the fifth and Screenplay in the eighth covered 1 1/16 miles on the grass in about two seconds more than Zagora did yesterday while setting the course record. Regardless, there was excitement to prevent people from losing interest completely. The fourth race was a New York-Bred stakes called The Clever Electrician. Alan Garcia aboard Fiddler’s Afleet beat David Cohen, one of the two Travers-winning jockeys, aboard the favorite Sailmate. In the day’s second stakes called the $600,000 Gr. I Personal Ensign, only six horses ran but one was the reigning Breeders’ Cup Ladies Classic champion Royal Delta. It’s Tricky, the second choice, stumbled twice in the race’s initial stages. She kissed the ground with her snout in the first instance. Eddie Castro might have made a tactical riding error by rushing her up in contention because when the Godolphin filly hit the stretch she had nothing left to give. Green Hills Farm and its trainer Todd Pletcher were the biggest beneficiaries of whatever took place. Their 10-1 Love and Pride, a daughter of A.P. Indy with John R. Velazquez in the irons, earned the trophy. For the second day in a row, a NYRA bigwig was seen among the great unwashed. On Travers Day, NYRA’s current board chairman traveled as far away from the clubhouse boxes as a board member has, all the way to Section H. On Sunday, two vice presidents strayed even farther into no man’s land to buy ice cream. The track went dark on the Sunday after the Travers last year. Hurricane Irene came a-callin’.